GUATEMALA CITY (CNS) — Mass at the Divine Providence Parish, celebrated shortly after polls closed in this country’s recent elections, included intentions. The parishioners prayed for the “people and pastors” of Guatemala, along with the country itself — where citizens, protesting peacefully for months, forced a president accused of corruption to resign in the days prior to the Sept. 6 vote. Guatemalans have protested and prayed and achieved unprecedented political change in their country. In the election, a plurality of them then voted for comedian-turned-candidate Jimmy Morales, 46, an Evangelical Christian with no political experience, hoping his lack of a past in a politics would prove a plus in a country with an unhappy history of politicians enriching themselves at the expense of a mostly poor population. The vote proceeded peacefully, as church officials had hoped. Morales, known for a previously popular TV program, offered few specifics in his campaign. Morales won 24 percent of the vote in a field of 14 candidates and will likely face former first lady Sandra Torres in an Oct. 25 runoff election. Torres divorced then-President Alvaro Colom in 2011 to avoid restrictions on running for president that year. Elections followed the resignation of President Otto Perez Molina, whom Congress stripped of immunity from prosecution. He faces corruption charges in a customs office fraud case known as La Linea (The Line) in which government officials, including his former vice president, allegedly accepted bribes from business owners wanting to pay lower import duties. Many priests and religious participated in the protests, too, although Quinteros called the church hierarchy response timid, with only an indirect call for Perez Molina to resign. Other Guatemalans prayed for change. “We joined (with Evangelicals) in a single cry to pray for Guatemala,” said taxi driver Samuel Marroquin, who worships in a charismatic renewal congregation. 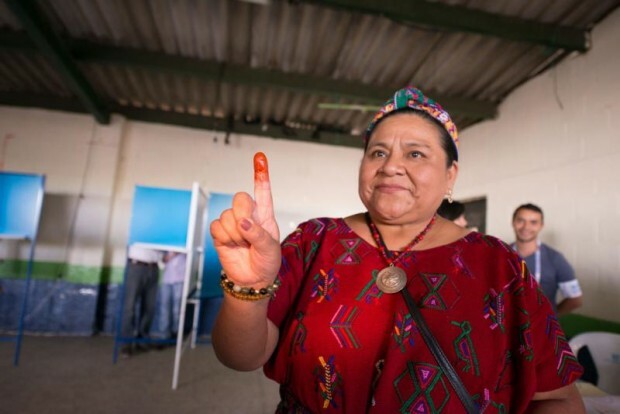 Morales promised clean government — a perpetual promise in Guatemala, Father Estrada said. Protests started in the spring after revelations of the La Linea scandal broke. In another scandal, a contract for providing kidney care in the state health service involved bribes to senior officials, including people close to the president. At least 13 patients died, according to press reports. Corruption scandals used to go uninvestigated or unpunished. That has started to change with the establishment of the International Commission Against Impunity in Guatemala during the last decade. Protesters in other Central American countries have called for the creation of similar commissions, operated by the international community and local governments. “(The commission) allowed upstanding Guatemalan officials to do their jobs without fear of losing their jobs or their lives (and) insulates to a certain extent the prosecutor’s office from charges of playing political favorites,” says Mike Allison, an expert on Central American politics at the Jesuit-run University of Scranton, Pennsylvania. The commission’s work helped spur the protests, too. Some citizens expect the anti-corruption clamor to continue, regardless of who wins the election.